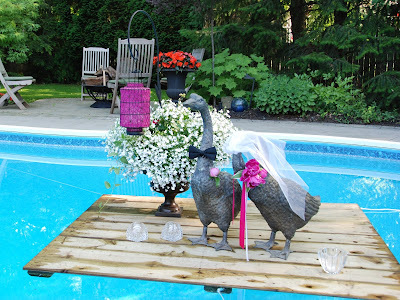 It is the perfect element to float in the pool creating a spectacular focal point. With a raft in the pool, it means the pool is closed for swimming ( which is great when you have small children or 19 year olds who don't understand that not all parties in the backyard are pool parties ). The raft measures 4' x5' and is made up of 9 - 1" x 6" fence boards. These boards were attached to 3 - 4" x 3" posts. Styrofoam was inserted to help it float. We added cup hooks onto 2 sides and one end and tied white rope to each one. The rope is then used to secure the raft and hold it in place. This allows us to position the raft more in the centre of the pool. 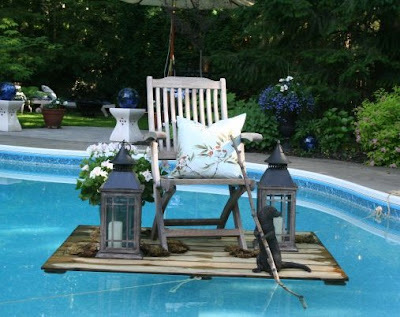 And voilà - a beautiful floating centrepiece for our parties! 1. Turn the pool pump off. The raft stays still and the water is like glass. 2. Tie the raft to 3 spots so it sits more in the centre of the pool. 3. Leave a long piece of rope on the ends. We place candles on the raft and light them when the sun sets. Simply untie 2 ends ( but have someone hold onto the ends ) and pull the raft to the edge to light the candles. 4. It usually requires 2 people to set it up before the party and involves one person to be in the pool.